▶What about Zinnor ommercial Fried ice cream machine? 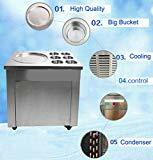 ▶Why you need my fried ice cream machine? This Fried ice machine is integrating the strongpoint of Fried ice machine at home and abroad, wide operation flexibility. When compared with similar products at home and abroad, small power consumption, energy saving effect is remarkable, if use cold storage, frozen Fried ice for the drinks, the effect is much better. Especially novel structure design, make the product appear particularly luxurious, beautiful and health. Product configuration material cylinder is easy to store all kinds of spices, to produce a variety of different flavors of ice. Very compelling, stop to attract customers to visit and taste all kinds of Fried ice products. This is the small cold drink soho in street stalls instruction in one of the most ideal equipment, as well as hotels, bars and small soda fountain of refrigeration equipment. ▶What is included in the package? 1.Since the refrigerant can not be transported, our products do not contain refrigerant. 2.you need add the R22 refrigerant into our product , after you received it. thank you!